Are you looking for a place where you can saddle up and see stars? If so, point your trusty steed towards Lone Pine. For western movie buffs, it’s the ideal Eastern Sierra community to hang up one’s spurs. 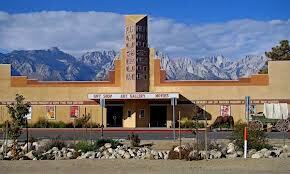 That’s because each year Lone Pine hosts a film festival that’s sure to please. It typically focuses on all of the movies that have been filmed in the area throughout the year. There’s also usually a great deal of legendary stars in attendance. This year’s long awaited event is slated to kickoff October 11th and run through October 13th. It’s expected to feature appearances by famous people known to those that love western films, television shows and literature. Among the famous folks expected to be in attendance for 2013 are David Rothel, Peggy Stewart and Billy King. Of course you don’t have to wait until then to revel in this Eastern Sierra community’s western charm. The area is also home to the Lone Pine Film History Museum, which hosts year round events like movie nights and art exhibits. There are also old filming sites and ghost towns to explore. Some of the ghost towns on offer in the surrounding areas are Cerro Gordo, Swansea, Keeler, Tramway and Darwin. Darwin was said to be the downfall of the western legend, three-fingered Jack. For some, Jack’s death was surprising, considering that at the time, the town was said to have more burros and men. When you’ve had your fill of films and ghosts, why not saddle up and head towards one of the area’s charming eateries? Options include the Alabama Hills Café & Bakery, the Pizza Factory, the Lone Star Bistro and the Mt. Whitney Restaurant. Mt. Whitney is known for its amazing movie memorabilia, juicy burgers and proximity to the local hiking trails. Speaking of hiking trails, some of the best ones are located just west of town. They are accessible from the area known as Whitney Portal. If you are up for breaking a sweat and enjoying stunning views, try the North Fork Lone Pine Creek Trail. It’s an extremely challenging trek that dead heads at Iceberg Lake. Other trails of note are the Mt. Whitney, Meysan Lakes and National Recreational. We should also mention that horseback riding trails are located in the area too. The trips are a wonderful way to enjoy the fall foliage and mountain air. For those that are interested, there are outfitters in the area that offer guided trips. Would you like to discover more of Lone Pine’s wonders or obtain information about the other Eastern Sierra communities of note? Contact us by calling (855) GO-MAGGIE or visiting our Sierra Resort Real Estate Mammoth Lakes, California Facebook page. While you’re there, be sure to “like” us and join in on the discussion about Eastern Sierra's communities.